I am using a Cintiq 13hd. It looks like the lines were drawn in Pixel Persona so I would expect them to look slightly jittery. If you do the same in Draw Persona where the lines are vector they will be nice and smoothe. I have attached an example. The top word is drawn in Draw Persona and the bottom word is in Pixel Persona. 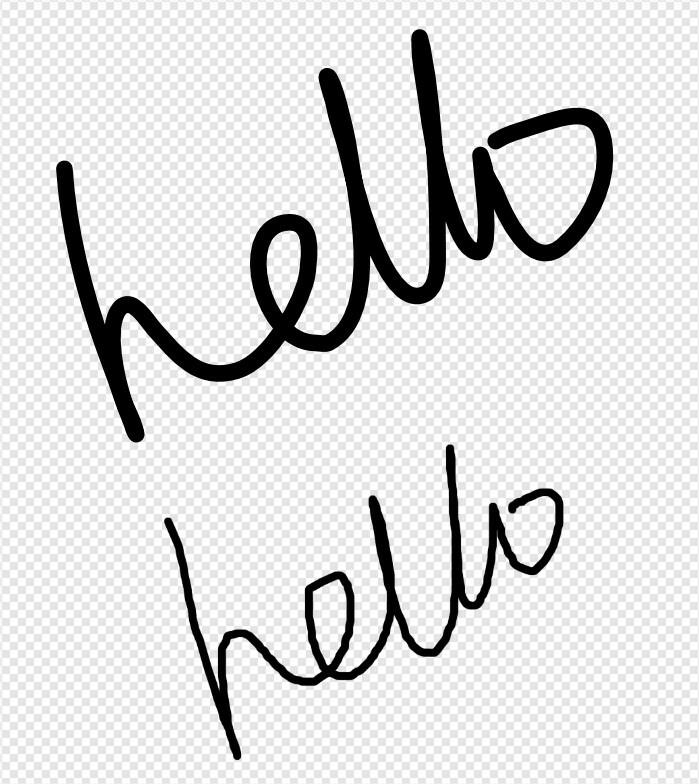 Drawing lines does seem to be worse with a Wacom tablet than it does with a mouse however when drawing words it seems there isn't much in it. It may have something to do with the speed of the pen vs mouse though. I get much smoother lines when drawing with the pen very quickly however when I draw at the same pace, the mouse seems to come out on top. I'm happy to pass this over to development for their input though as I can see what you mean when it comes to drawing lines. The only thing to do is compare the input across applications. Comparing Pen vs Mouse isn't that useful. Chances are, other applications smooth the input that comes from the Pen, whereas we're handling the raw points (we smooth the input curve in Vector Persona, just not Pixel Persona). Going to bump this thread to say I'm experiencing the same issue. I tried with both Web and Print adapted files, I even tried with the Lazy Nezumi plugin I use for Photoshop to get better looking lines. They still look jittery. I'm using the latest Affinity Beta build (1.5.0.7) on Windows 10 64bit. My tablet is a Wacom Intuos4, driver 6.3.2-3. It's an old driver that I'm still using because the newest ones at the time gave me issues, I'm unsure if the current ones are still broken or not, or if upgrading will help anything with the jittery issue on Affinity. I could draw my lines in Draw Persona, but not with how it auto-smooths at the moment. Bad for tracing sketches. Although I also notice the lines come out jittery before they are auto-smoothed, so this may not be just a Pixel Persona issue. Using my old Cintiqu 21ux and have perfectly smooth lines. Wonder if there are background tasks eating up the performance doing that. Machine I am running is a 4.2ghz AMD 8 core and ATI r9 video. Not an Intel but working really really nice. I recently bought a Dell 2:1 with an i5, and had all kinds of problems with performance and it turned out to be McAffee. Once I removed that and use Win Defender I have no performance issues. For Kicks if you have that or Norton try turning them off and see if there is a difference. Checking CPU usage wouldn't hurt to see what may be the culprit if that is the case. I can confirm this behaviour with my Wacom Intuos Pro 5. It is actually not the first time I have seen this occurring in software: Photoline, Photoshop CS6 (CC 2015 seems to have improved, but it is still there), Krita, Paint (worst of the lot), Gimp, and other drawing software (except for ClipStudio). b - no smoothing algorithm is applied (or at the wrong time when drawing). As far as I can tell, the cause is that Windows seems to sample per physical screen pixel; zoom out, and the number of pixels to sample from are reduced, and have to be interpolated between actual positions relative to the zoomed out pixel canvas. In short: the higher resolution the image is, and the more you zoom out, the worse the interpolation errors become and the quality of the lines suffers. 2) zoom out to view the entire canvas. 4) Draw. Zoom out more. Draw again. Zoom out one last time, and draw a final curvy line. Each line becomes progressively worse when you examine each respective drawn line zoomed in. Try this in Paint, or Krita without stabilizer, and you will be shocked at the line quality (or rather, the distinct lack thereof). 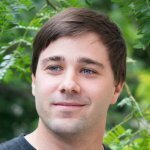 A couple of years ago I mentioned this to the Photoline developers, and they implemented a stroke stabilizer comparable to Krita, Lazy Nezumi, and ClipStudio. When I turn this on, I am able to draw beautiful smooth and precise lines, whether in vector or bitmap mode at any resolution, and any zoom level. 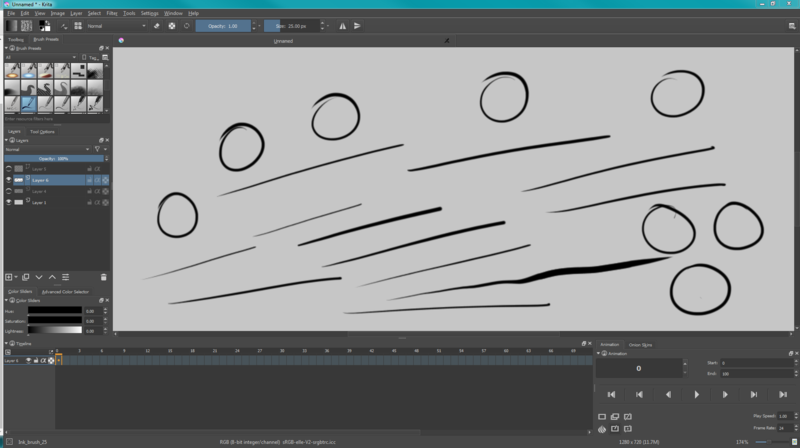 The same for Krita: turn off any stroke stabilization, and you will notice the same issue. 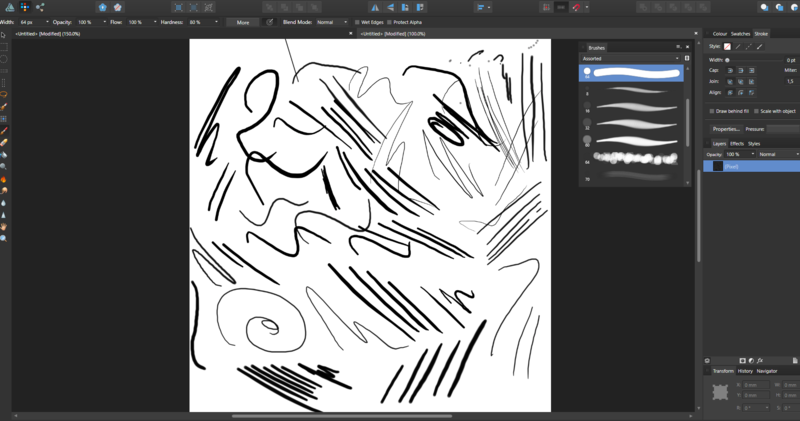 Clipstudio produces extraordinarily nice strokes even with the stabilizer deactivated, and zoomed out on a very high resolution canvas. They must be using some kind of custom interpolation algorithm to achieve this (btw, nothing compares to Clipstudio in regards to drawing feel and quality!). I also discovered that when my Wacom is covering only the screen I am drawing on (instead of all three screens) the jitters do reduce a bit. Affinity Designer does not offer any stroke stabilization while drawing, which results in simliar line quality issues. although the exact end result depends also on the internal interpolation of each application. For example, Paint is terrible when painting zoomed out. The solution is quite simple: implement a stroke stabilizer function. Just do it. Windows is at fault here, as far as I can tell. 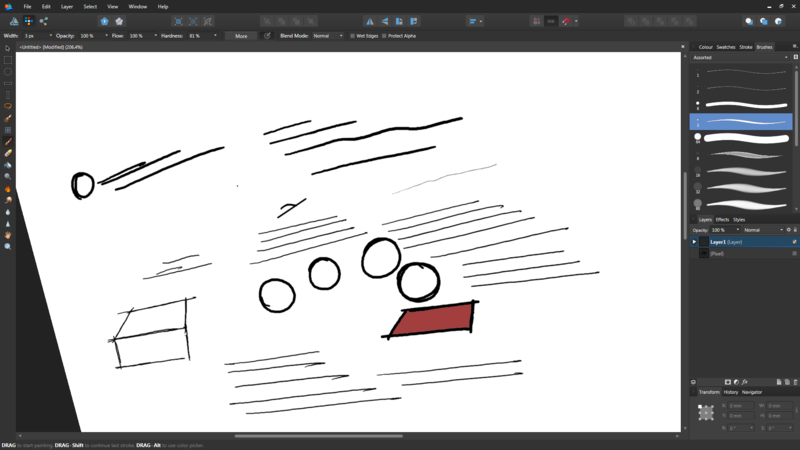 And this will also improve the drawing functionality of Affinity. And make certain to add this to both Designer and Photo. 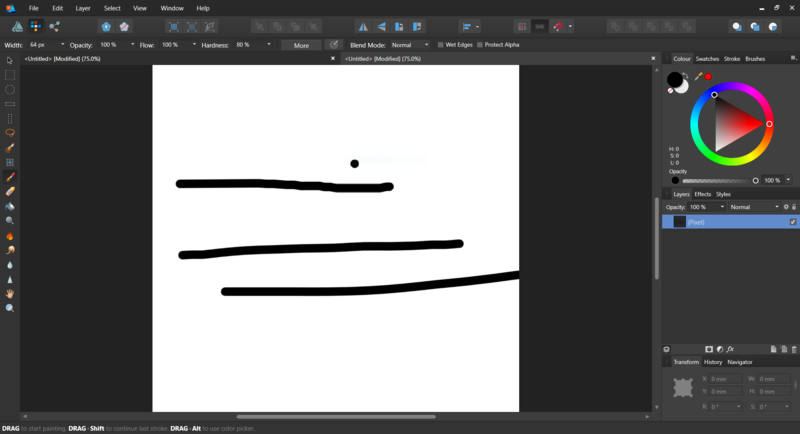 And aside from solving the interpolation issue while drawing, one more advantage is that you expand the drawing features with an option that is available in most competing drawing software products out there as well (Photoshop being the odd duckling, which requires Lazy Nezumi). Thanks to everyone who posted here. I was having the same issues and thought it was just me. Hi everyone, just to let you know, we're currently looking at this issue, and hope to have a solution soon. Thanks for your feedback. Speaking of such, is it possible to have the smoothing customizable? I find the Affinity smoothing to be barely noticeable, I'd like an option for very strong smoothing. In Illustrator I often have the smoothing at maximum, simply because I use the Brush tool to draw the final lines, so I don't want any jitteryness. If any short line requires less smoothing then I'll turn it down just for that line and then go back up again. A stroke stabilizer - that is what is needed. In the meantime you could try Lazy Nezumi. Not quite, if you look at what Illustrator does, it's not really stroke stabilizing. It does something which I think it's better, at least for vector lines, it's stroke redrawing. This is better for a reason, the stroke that Illustrator redraws has a lot less nodes make it easier to modify/edit. A stabilizer, especially an external one, will not guarantee a line with the least amount of nodes possible. I'm experiencing the same issue in Affinity Photo (probably Designer too). In Autodesk SketchBook it works fine, so there's nothing wrong with my tablet. I'm using a Wacom Intuos Pro S.
The stabiliser makes the strokes smooth, but I can't draw like that because stabiliser causes a delay (that's how it works) so it's not an acceptable solution. Also the vector persona in Designer isn't acceptable because I want to draw with pixels, not vectors (also the strokes change a bit after they are drawn because of the smoothing algorithm). So currently I can't draw in Affinity software.